Stade Roland Garros ("Roland Garros Stadium", French pronunciation: ​[stad ʁɔlɑ̃ ɡaʁos]) is a tennis venue located in Paris, France, that hosts the French Open—also known as Roland Garros, particularly within Europe—a Grand Slam championship tournament played annually around the end of May and the beginning of June. It is named for Roland Garros, a pioneering French aviator. The facility was constructed in 1928 to host France's first defence of the Davis Cup. The 8.5-hectare (21-acre) complex contains twenty courts, including three large-capacity stadiums; Les Jardins de Roland Garros, a large restaurant and bar complex; Le Village, the press and VIP area; France's National Training Centre (CNE); and the Tenniseum, a bilingual, multimedia museum of the history of tennis. The stadium is named after Roland Garros, a pioneer aviator who completed the first solo flight across the Mediterranean Sea, engineer (inventor of the first forward-firing aircraft machine gun), and World War I hero (as a pilot, he shot down four enemy aircraft, though popularly believed to be five). Garros was killed in aerial combat in 1918. Monument in Place des Mousquetaires to France's string of Davis Cup victories (1927–1933). Roland Garros was constructed to provide a venue for France's first successful Cup defense in 1928. France was an important power in tennis during the first half of the 20th century due to the dominance of Suzanne Lenglen during the 1910s and 1920s, and les Quatre Mousquetaires ("the Four Musketeers")—Jacques "Toto" Brugnon, Jean Borotra (the "Bouncing Basque"), Henri Cochet (the "Magician"), and René Lacoste (the "Crocodile")—in the 1920s and 1930s. In 1927, France defeated the United States to win the Davis Cup, due largely to the Musketeers' efforts. Roland Garros was constructed as a venue for France's successful defense the following year. France retained the Cup until 1933, again largely because of the Musketeers. A monument to France's six Cup championships stands at the center of Place des Mousquetaires, a circular courtyard near the venue's entrance. In October 1939, shortly after the outbreak of World War II, the facility was used as a detention centre where "indésirables"—mostly Hungarians, Russians, Italians, Poles, and citizens suspected of being communists—were held pending imprisonment. Journalist and former communist Arthur Koestler reported that at the time of his detention, posters advertising the last match prior to the outbreak of war, between Cochet and Borotra, were still in place. While the Roland Garros surface is invariably characterized as "red clay", the courts are in fact surfaced with white limestone covered with a few millimeters of powdered red brick dust. Beneath the 3-inch (7.6 cm) layer of porous limestone is 6 inches (15 cm) of volcanic rock, followed by a 3 feet (91 cm) layer of sand, all of which rests on a slab of concrete. Crushed brick is pressed onto the limestone surface with rollers, then drenched in water. The process is repeated several times until a thin, compact layer coats each court. The crushed brick is deep enough to allow footprints and ball marks, but shallow enough to avoid making the court spongy or slippery. In tournament situations workers smooth the surface before matches and between sets by dragging rectangular lengths of chain-link across it. The red brick dust is replenished as needed (daily during major tournaments). Court Philippe Chatrier was built in 1928 as Roland Garros's centerpiece and remains its principal venue, seating 14,840 spectators (reduced from 15,166 in 2010 to accommodate new press boxes). The stadium was known simply as "Court Central" until 2001, when it was renamed for the long-time president of the Fédération Française de Tennis (FFT) who helped restore tennis as a Summer Olympics sport in 1988. The four main spectator grandstands are named for les Quatre Mousquetaires—Brugnon, Borotra, Cochet, and Lacoste—in honor of their Davis Cup success, which prompted construction of the facility, and the stadium. As a further tribute, the trophy awarded each year to the French Open men's singles champion is known as La Coupe des Mousquetaires. Built in 1994 and originally designated "Court A", Court Suzanne Lenglen is the secondary stadium with a capacity of 10,068 spectators. Its namesake, an international celebrity and the first true star of women's tennis, won 31 major tournaments, including six French Open titles and six Wimbledon championships, between 1914 and 1926. Known as La Divine ("Divine One") and La Grand Dame ("Great Lady") of French tennis, she also won two Olympic gold medals in Antwerp in 1920. A bronze bas relief of Lenglen by the Italian sculptor Vito Tongiani stands over the east tunnel-entrance to the stadium. The trophy awarded each year to the French Open women's singles champion is named La Coupe Suzanne Lenglen in her honor. The court has an underground irrigation system, the first of its kind, to control moisture levels within its surface. In 1994, the walkway between Court Chatrier and Court Lenglen was named Allée Marcel Bernard, in honor of the 1940s-era French champion who died that year. Nicknamed the "Bullring" because of its circular shape, Court 1 is the facility's tertiary venue. Its architect, Jean Lovera, a former French junior champion, designed the 3,800-seat structure as a deliberate contrast to the adjacent, angular Court Philippe Chatrier. Built in 1980, the Bullring is a favorite among serious tennis fans because of its relatively small size and feeling of close proximity to the action. An unusual design feature is its press seating in the first row at court level behind the south baseline. Court 1 has been the scene of several stunning French Open upsets, such as unseeded Gustavo Kuerten's 3rd-round victory over fifth-seeded former champion Thomas Muster in 1997, on his way to his first of three Open titles; and third-seeded Gabriela Sabatini's defeat—after a 6-1, 5-1 lead and five match points—to Mary Joe Fernandez, the fifth seed, in the 1993 quarterfinals. It was also the site of Marat Safin's famous "dropped pants" match against Félix Mantilla in 2004. Known officially as the Museum of the French Federation of Tennis, the Tenniseum was designed by the French architect Bruno Moinard and opened in May 2003. It is housed in a former groundsman's cottage, and comprises a multimedia center, media library, and permanent and temporary exhibits dedicated to the history of tennis in general, and the French Open in particular. Permanent exhibits include a display of the French Open perpetual trophies, including La Coupe des Mousquetaires and La Coupe Suzanne Lenglen; a narrative and photographic history of Roland Garros; displays documenting the evolution of tennis attire through the years; a comprehensive collection of tennis racquets dating back to the mid-19th century; and a large exhibition of tennis-related photographs and paintings. The media library houses a diverse collection of documents, posters, books, and magazines, as well as a database of tennis information, statistics, trivia, and match summaries of all French Open tournament matches since 1928. The bilingual (French/English) multimedia center contains over 4,000 hours of digitized video including documentaries, interviews with many of the sport's legendary players, and film archives dating from 1897 to the present. Tours are conducted daily. (Two per day, at 11:00am and 3:00pm, are in English.) During the French Open the normal entry fee is waived for tournament ticket-holders. In 2009 the Fédération Française de Tennis (FFT) announced that it had commissioned the French architect Marc Mimram (designer of the Passerelle des Deux Rives footbridge across the Rhine River in Strasbourg) to design a significant expansion of Stade Roland Garros. On the current property, the proposal called for the addition of lights and a retractable roof over Court Philippe Chatrier. At the nearby Georges Hébert municipal recreation area, east of Roland Garros at Porte d'Auteuil, a fourth stadium will be built with a retractable roof and 14,600 seating capacity, along with two smaller show courts with seating for 1,500 and 750. Rafael Nadal displaying La Coupe des Mousquetaires after winning his second French Open title in 2006. In 2010, faced with opposition to the proposed expansion from factions within the Paris City Council, the FFT announced that it was considering an alternate plan to move the French Open to a new, 55-court venue outside of Paris city limits. The three sites reportedly under consideration were Marne-la-Vallée (site of the Euro Disney resort), the northern Paris suburb of Gonesse near Charles de Gaulle Airport, and a vacant army base near Versailles. Amid charges of bluffing and brinkmanship, a spokesman explained that because Roland Garros is less than half the size of the other three Grand Slam venues and has no covered courts, the French Open was at risk of losing its Grand Slam status to Madrid—which has a long clay court tradition and larger facilities—or the Gulf countries, "who were ready to offer some crazy prize money". As a result, he said, the FFT was left with only two viable options: expansion of Roland Garros or relocation of the event. In February 2011, the FFT voted to keep the tournament at Roland Garros, citing the prohibitive expense ($630 million to $1 billion) of building a new venue from scratch versus a projected $370 million to carry out the proposed expansion. Further details of the plan were announced in May 2013, including a complete rebuild of the Chatrier court on its existing foundations in addition to the new roof and lights, and a larger Place des Mousquetaires in the area now occupied by Court 1. The new stadium at Porte d'Auteuil would be built below ground level, with greenhouses surrounding it on all four sides. Project deadlines were pushed back from 2016 to 2018. Local residents, wildlife enthusiasts and municipal authorities continued to voice opposition to the plan, which would increase the Roland Garros grounds from 21 acres (8.5 hectares) to about 33.8 acres (13.5 hectares). In February 2015, the renovation encountered another obstacle when the Ministry of Ecology issued a negative report, and the project was placed on hold in March pending completion of a new land use study for the City Council. In June, shortly after conclusion of the 2015 French Open, Paris Mayor Anne Hidalgo announced that construction permits had been signed, with a new cost estimate of $450 million and completion further delayed to 2019. Opponents, who objected to the demolition of 2.5 acres (1 hectare) of greenhouses and biological gardens within Porte d'Auteuil on the eastern border of the current facility, proposed an alternate, northward expansion into the Bois de Boulogne that would require covering a portion of the A13 highway. Proponents of the eastward expansion argued that further delays would jeopardize Paris's bid for the 2024 Olympic games. In December 2015, the Paris Administrative Court ordered suspension of reclamation work involving the Auteuil botanical garden greenhouses. In a statement, the FFT responded that the greenhouses would not be destroyed, and would, in fact, be "embellished". FFT also noted that opponents of the eastward expansion "[did] not have good alternatives from the operational, legal and environmental point of view", and added that expansion into the Bois de Boulogne was "impossible". In February 2017, the last of the legal challenges were resolved and work resumed on the original, eastward expansion plan. FFT officials announced that the new tournament organization building and Village, new courts 7 and 9, the expanded Place des Mousquetaires, and a new show court in the Fond des Princes area west of Court Lenglen are scheduled for completion in time for the 2018 Open. The Porte d'Auteuil Court des Serres (Greenhouse Court) should be ready for the 2019 tournament, and the rebuilt Court Chatrier by 2020. Roland Garros is located at the southern boundary of the Bois de Boulogne in Paris's 16th arrondissement. The triangular property is bounded by Avenue Porte d'Auteuil on the north and Boulevard d'Auteuil on the south. The eastern boundary is Avenue Gordon Bennett. The closest Métro stations are Porte d'Auteuil (Line 10) and Michel-Ange–Molitor (Line 9, Line 10), to the north- and southeast respectively. A special Roland Garros taxi stand operates in May and June during the French Open on the southeast corner of the venue grounds, at the corner of Robert Schuman Avenue and Auteuil Boulevard. ^ "Roland Garros – Paris". Archived from the original on 2010-05-30. ^ Eating Your Way Through Roland Garros. Gem Tennis. Retrieved 2010-08-17. ^ Franks, Norman; Bailey, Frank W. (1992). Over the Front: A Complete Record of the Fighter Aces and Units of the United States and French Air Services, 1914–1918. Grub Street. ISBN 978-0-948817-54-0. .
^ a b A Visit to Roland Garros. Colleen's Paris Retrieved 2010-08-16. 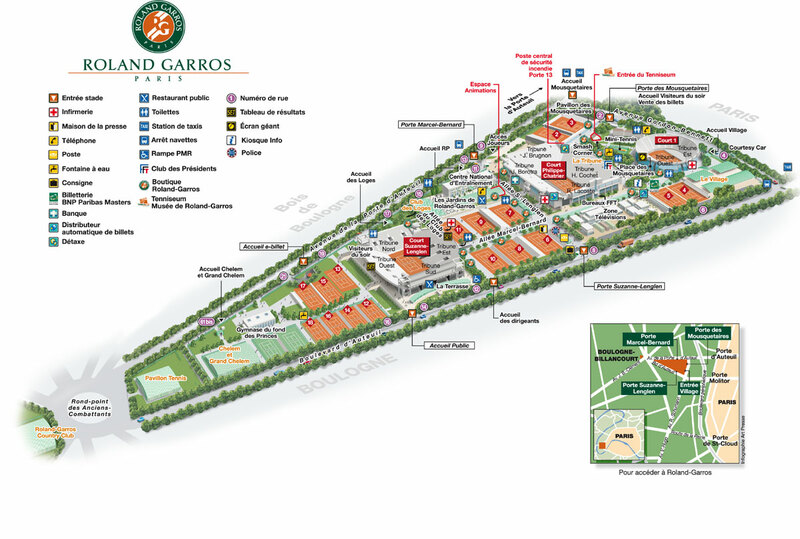 ^ a b c d Stade Roland Garros Venues. rolandgarros.com Archived 2010-06-01 at the Wayback Machine Retrieved 2010-08-17. ^ Koestler, Arthur (1941). Scum of the Earth. London: Eland. pp. 61–91. ISBN 978-090787149-1. ^ Koestler, Arthur (1941). Scum of the Earth. London: Eland. p. 85. ISBN 978-090787149-1. ^ a b Branch, John (28 May 2010). "Some Rouge Dresses Up Courts at Roland Garros". The New York Times. Retrieved 11 June 2015. ^ Lavallee, Andrew R. "Clay Courts: What Are They Anyway?". XSports.com. Archived from the original on 27 November 2013. Retrieved 11 June 2015. ^ Tennis Ticket News Archived 2012-05-24 at Archive.today Retrieved 2010-08-16. ^ Court Philippe Chatrier. WorldStadia.com Retrieved 2010-08-16. ^ "Philippe-Chatrier Court". Rolland-Garros. Retrieved 2015-06-11. ^ Tignor, Steve (27 May 2010): Nothing Compares to Tennis in the Bullring. NBC Sports Retrieved 2010-08-17. ^ Robin Finn (31 May 1997). "Sampras and Muster Exit in Paris". The New York Times. Retrieved 2015-06-11. ^ Fernandez Turns Rout Into Rousing Comeback (2 June 1993). New York Times Retrieved 2010-08-19. ^ "Safin on mooning crowd: 'What's bad about it?". ESPN. 29 May 2004. Retrieved 2015-06-11. ^ "Tenniseum website". Archived from the original on 2010-08-25. ^ Mimram Footbridge. Culture Routes Archived 2011-07-19 at the Wayback Machine Retrieved 18 August 2010. ^ Meeting Modern Demands. Roland Garros official web site. Retrieved 14 July 2015. ^ John Martin (22 May 2010). "French Officials Consider Relocation Options for the Open". The New York Times. Retrieved 2015-06-11. ^ a b Expansion of Roland Garros Aims to Preserve Parisian Style. Newsweek (May 25, 2017), retrieved May 31, 2017. ^ "French Open May Have to leave Paris". Retrieved 29 March 2015. ^ "French Open staying at Roland Garros". ESPN. 13 February 2011. ^ "Moderization Project Threatened". Retrieved 29 March 2015. ^ "The Misunderstanding of the French Tennis Federation". Retrieved 29 March 2015. ^ "Roland Garros Revamp Gets Green Light". NDTV. 10 June 2015. Retrieved 2015-06-11. ^ Nerves Fray Over New French Open Stadium Plans (May 22, 2015). New York Times archive. Retrieved June 11, 2015. ^ Roland-Garros : A Counter-Proposal by the Associations. The Art Tribune. Retrieved June 11, 2015. ^ "Roland Garros Deals With Growing Pains". Retrieved 29 March 2015. ^ "Roland Garros renovation on hold". Retrieved 29 March 2015. ^ Roland Garros Expansion, Roof over Chatrier Set to Proceed Tennis Now (February 3, 2017), retrieved May 30, 2017. ^ New Stadium Project. RolandGarros.com, retrieved May 31, 2017. Wikimedia Commons has media related to Stade Roland-Garros.